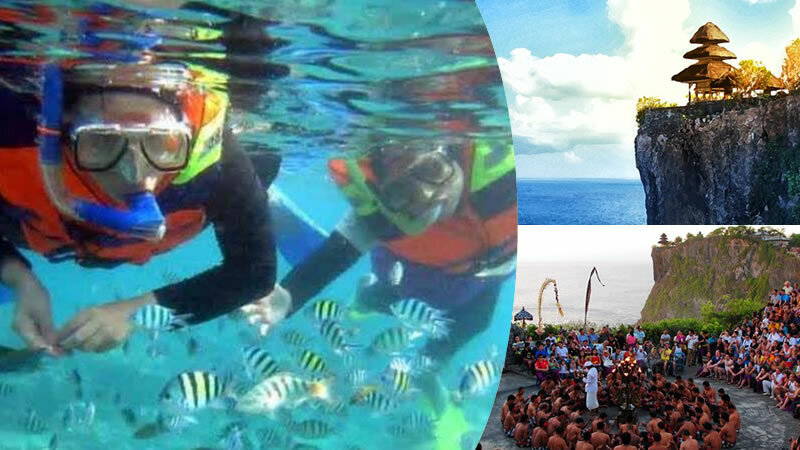 This is a fantastic combination of Bali snorkeling with sightseeing tour all-in-one super deal price package. We provide various kinds of Bali watersport package for our special guest. Full day Bali snorkeling with Uluwatu Tour + Kecak Dance is one of them. Bali Snorkeling with Uluwatu Tour + Kecak Dance is a perfect combination package for Bali water sports at Tanjung Benoa beach which will be joined with a famous Bali sightseeing trip by visiting a beautiful beach at Southern Peninsula, Uluwatu Cliff Temple as one of the famous Temple in Bali, then will be continued by enjoy the Magical show of Kecak & fire dance show while sunset. Don’t miss it and book your tour only with us. This combination package tour will give you a memorable experience during your water sport in Bali. 09.00 – Depart from Hotel. 10.00 – Visit Tanjung Benoa Beach for snorkeling & Visit the turtle conservation island with glass bottom boat. 12.30 – Having Light Lunch & soft drink. 14.00 – Visit Bali Beach ; Either Pandawa Beach or Dreamland beach or Padang-Padang Beach. 21.30 – Transfer Back to hotel.